The total number of persons newly received by public prosecutors (including juvenile cases) was 1,481,665 in 2011, down 86,634 (5.5%) from the previous year. The total number of persons newly received for penal code offenses was increasing from 1998 but then turned to decrease in 2005, and was 964,527 in 2011 (down 4.5% from the previous year). The number of persons newly received for special act offenses was on a decreasing trend from 2000 and was 517,138 in 2011 (down 7.4% (id.)) (Source: Annual Report of Statistics on Prosecution). Fig. 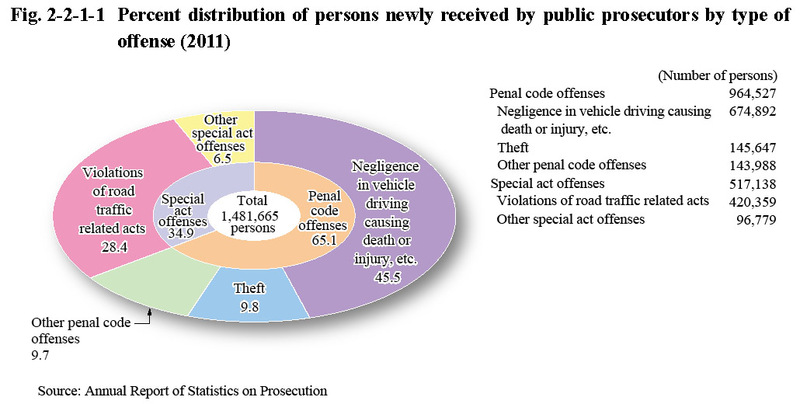 2-2-1-1 shows the percent distribution of persons newly received by public prosecutors by type of offense in 2011. Of persons received for penal code offenses, those received for negligence in vehicle driving causing death or injury, etc. accounted for the majority at 674,892 and the number of those received for non-traffic penal code offenses was 289,635. Theft accounted for the largest number of non-traffic penal code offenses at 145,647, followed by injury at 25,800, embezzlement (including embezzlement of lost property) at 25,643, and fraud at 17,043. Of persons received for special act offenses the number of those received for violations of road traffic related acts was 420,359 and for special act offenses excluding violations of road traffic related acts 96,779 (See Appendix 2-1). Table 2-2-1-2 shows the number of persons newly received by public prosecutors for non-traffic penal code offenses and special act offenses excluding violations of road traffic related acts by the type of their reception in 2011. The number includes those referred or transferred by general judicial police officers, as well as special judicial police officers, including coast guard officers and narcotics agents, etc., and also those public prosecutors detected themselves or received complaints/accusations about.